Sweet creamy treats made of pecans coated with a caramel-flavored coating. 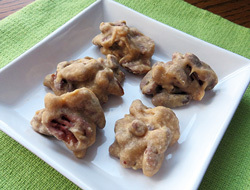 The bourbon adds a nice touch to this recipe and compliments the flavor of the caramel coating on these pralines. A popular item in New Orleans, these Bourbon Pralines make a nice treat to enjoy at any of your Mardi Gras celebrations or at any special gathering. Prepare two medium-sized baking sheets by lightly coating with butter and then set aside to use later. Lightly coat a small baking sheet with butter and spread the pecan halves and pieces on it in a single layer. 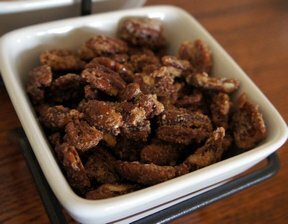 In an oven preheated to 350° F., place the baking sheet of pecans in the oven for 5 minutes to toast them. Watch carefully so they do not scorch; remove and set aside. Melt the butter to a heavy saucepan over medium heat and then stir in the sugars. Add the cream and stir to mix well. Continue to cook and stir the mixture until boiling. After it comes to a full boil, turn heat down to medium-low and continue to cook until it reaches 236° F. on a candy thermometer (soft-ball stage). This may take 15 to 20 minutes. Stir occasionally throughout cooking time. 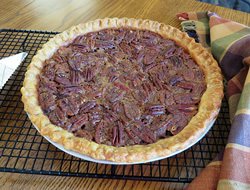 Once it reaches 236°, remove it from the heat and add the toasted pecans and the bourbon. Stir to mix in bourbon and evenly coat the pecans. 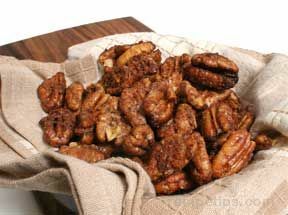 As quickly as possible, use a tablespoon to drop the pecans onto the buttered baking sheets. Once the pralines have cooled and set up, remove from the baking sheets and store in an airtight container. "I tried making these because my husband likes this type of thing. They didn't look very good but they were so yummy! The flavor was great and my husband loved them. I will make these for a special treat again."